The Suite is spacious and airy with a combination living and dining area and a kitchenette. The bedroom features an en-suite bathroom, a queen-size bed, air conditioning, ceiling fan and cable television. Some One-Bedroom Suites are also equipped with a roll-out sofa for accommodating additional guests. 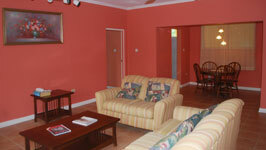 The Suite is perfect for an extended and relaxing trip to Mandeville.